The client required eight intelligent completion installations with four nodes of injection in the lower completion over a near horizontal sand face section. The solution was to run TCO’s Q-Series flow regulation devices, with each device connected in series to a single injection line. Four Q-Series devices were installed 4,000ft below the Control Line Wet Mate (CLWM) Connector in the lower completion sand screen face, circa 11,000ft TVD. The purpose of these devices is to deliver fresh water injection across four nodes within the Carboniferous formation to minimise the risk of halite scale build up within the formation from the gas producing reservoir. In this application one 3/8” injection line (line A) is run from surface and is stepped down to 1/4” at circa 7,500ft. This single line is used to supply the fresh water to the devices run in series. Each device is calibrated and tested to deliver 282 L/day per device with the expected system injection rate across the four nodes at 1,128 L/day or 7.1 bbl/day. Two F-Series devices set with 1,900 psi back pressure were installed in the upper completion to eliminate hydrostatic fall out (or U-tubing) of the control line fluid in the A injection line. The upper F-Series device is installed at circa 3,800ft and the lower F-Series at circa 7,300ft. As the reservoir pressures decreases over mid and late life of the well, the F-Series devices will prevent fall through of injection fluid from the injection line into the well bore, preventing unwanted control line deposits and ensuring stable flow rates at the point of injection over the life time of the field. With the flow rate set, each device will operate independently of the well bore pressure at each injection node. 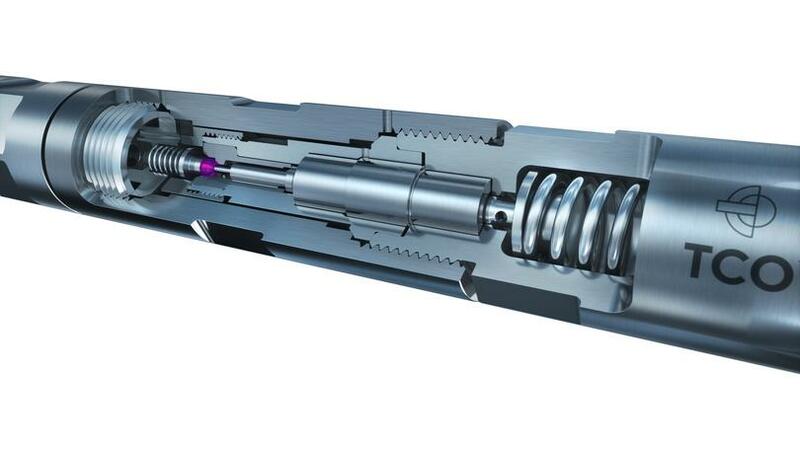 The devices will deliver consistent fluid flow irrespective of the control line pressure providing the injection flow rate and pressure is maintained above the minimum surface pressure value to achieve the 282 L/day or 1.78 bbl/day, as specified for the application by the client. 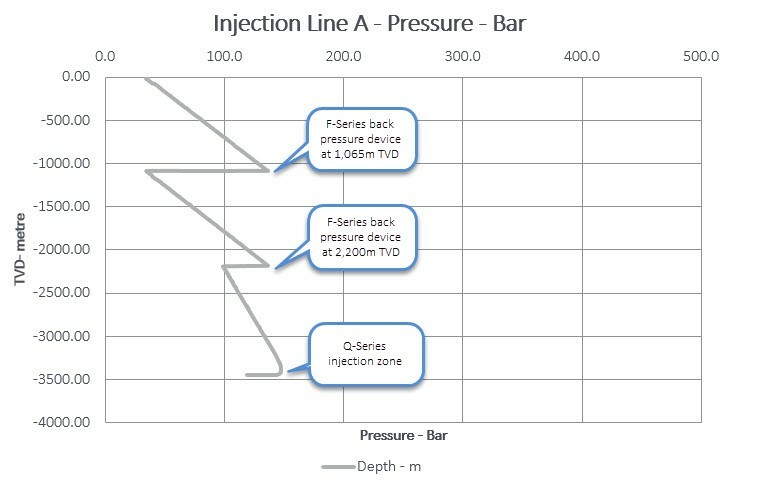 The Well Maps graph (above) shows the calculated injection line pressure trend for Line A during the end of life phase of the well, with an expected reservoir pressure of 85bar and a flow rate of 7.1bbl/day. Expected surface injection pressure during this phase is 36bar with a minimum line pressure of 35bar. Using TCO’s proprietary Well Maps system, the characteristics and late life pressure dynamics of the injection line can be modelled against the surveyed geodetics provided by the customer. Well Maps will identify the required topside injection pressure to maintain continuous flow through the four injection nodes, whilst accounting for the downhole conditions and hydrostatic pressure within the control line. One of the challenges to overcome with this fresh water injection installation was the high probability of sand within the formation packing around the injection nodes. TCO overcame this concern by implementing a 360° radial injection feature on the Carrier Sub for the device. This design allows the injection fluid to follow the path of least resistance into the sand face, overcoming any issue of the formation packing off against the device Carrier Sub. 3 ½” SLHT-S timed connections are used throughout the 3 ½” tubing assemblies; this allows each assembly to make-up to a set datum point during make-up to align the eccentric Sand Screens and Q-Series Carriers and to maintain a straight feed for the control and fibre optic line. Each Device Carrier is connected between 250 micron premium screens spaced out with pup joints over a near horizontal length of 3,000ft. A total of 28 devices were installed over seven gas condensate production wells, which are expected to contribute 5% of UK gas production. The field life is approximately 20 years. Additional wells will start production in Q3 2017. Gas production from the first well commenced December 2016, with the water injection system brought online simultaneously. Information received from the operator shows that the TCO injection system is functioning effectively with stable and consistent injection pressures across all producing wells. TCO’s expert analysis and support during the start-up phase has given our customer a high degree of confidence in the systems functionality and robustness. Detailed analysis of the data by TCO confirms that in each functioning system, the Q-Series devices are accurately distributing wash water at stable flow rates across the 4 injection nodes via a single injection line to surface. The TCO injection system has provided the operator with a cost effective and reliable means of preventing halite build-up across the horizontal sand face over the life of the field.